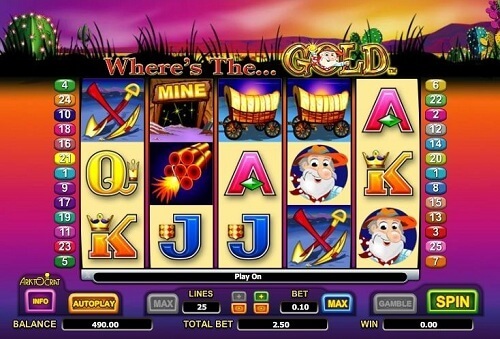 Where’s the Gold is a glitzy online pokie game by Aristocrat Technologies. It features excellent animations and a very good payout percentage. Where’s the Gold online slot is very popular to both low and high stake players in Australia. Read on to find out why Where’s the Gold pokie is definitely your ‘must-play’ online slots game. Where’s the Gold is all about digging for gold. The online pokie game follows a quest of a gold digger trying to find the precious metal. The game is a 5-reel online slot with 25 paylines. The symbols featured on the Where’s the Gold paint a scene of the gold rush; mountains, cacti, prospector and his pickaxe and more including face values. The games’ Scatter symbol is represented by a picture of dynamite. Once triggered you get to enjoy free spins. Meanwhile, the Wild symbol is represented by gold symbols. Wild symbols can replace all other symbols excluding the Scatter symbol. More so, when you get three or more scatters on your screen, you will be taken to a bonus round. 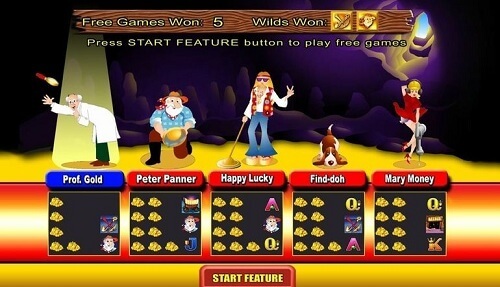 There you get to choose from five miners: Professor Gold, Happy Lucky, Peter Panner, Mary Money and Find-doh the dog. Each of them will start digging for gold and come up with extra wild symbols and free spins. Your miner of choice will dictate how many free spins you receive. To play Where’s the Gold, first select the amount and number of lines you want to wager. Your next step is to then click on ‘spin’ to set the wheel on motion. Australian online casino players can click on ‘autoplay’ to repeatedly wager a certain number of spins or a certain amount. The bet amount on Where’s the Gold start from as little as $0.01 per line up to $4. You can wager on the overall pokie game for $100. Where’s the Gold Online Pokie is a great online pokie game to play. However, Aussies need to note that it is not a progressive slot. But, punters can scoop up to $4000 in jackpots on the online game. So what are you waiting for? Let’s get digging at the best Australian online casinos here!